Brendon Hill Faerly Certain aka Bea was bred by Diana Scott at Brendon Hill Stud in Somerset, England. She is by It's Without Doubt, who is by Welton Louis, out of Faerie Diadem, who placed 5th at Boekelo CCI*** in 1995 with William Fox-Pitt in the irons. Diana's famous stallion Ben Faerie is the sire of Faerie Diadem who also sired Ginny Leng's famous Event horses Priceless and Night Cap. She is also related to Primmore's Pride, out of Primmore Hill by Ben Faerie, who Pippa Funnel won two legs of the Grand Slam of Eventing with in 2003. 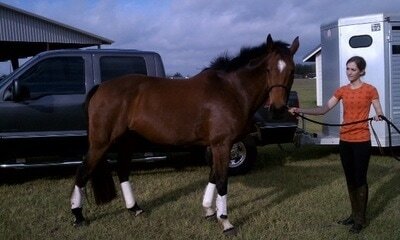 Bea was purchased as a yearling in 2004 and shipped to the Unites States later that year. She was started here at Silver Oak Farm and eventually purchased by one of Patricia's students, Darby Green-Shaw. Bea continues to shine with Darby as they begin their career in eventing.